Hydrocolloids (aka “gums”) have revolutionized the way many chefs cook. Using hydrocolloids allows a chef create almost any shape and achieve almost any texture using food, all without compromising flavor. In the past, gums have gotten a bad rap among consumers, who perceive them as additives used by industrial food producers for economy and convenience; they can ease fabrication and make products that are cheaper, easier to ship, easier to freeze, and harder to spoil. It doesn’t help that names such as “xanthan gum” and “carboxymethycellulose” just don’t sound appetizing, either. However, as the number of chefs migrating hydrocolloids from additive to ingredient in the pursuit of creating better and more interesting food grows, so increases the number of savvy consumers who abandon prejudices against its usage. Hydrocolloids are large molecules that interact with water, and are defined as a type of mechanical mixture where one substance is dispersed evenly throughout water. A hydrocolloid has colloid particles spread throughout water and depending on the quantity of water available can behave as a gel or liquid. Many hydrocolloids can change their physical behavior and characteristics with the addition or elimination of heat. They have the ability to thicken and form gels at very low concentrations. Some can be used as whipping agents to make foams, and some act as emulsifiers. With the exception of gelatin (which is a protein), all hydrocolloids are polysaccharides, or complex sugars. When a hydrocolloid is dissolved in water, the water gathers around and is attracted to the sugar units, forming a layer of water with restricted movement. It is this ability to organize and control water that gives hydrocolloids their ability to thicken and gel. The properties of any particular hydrocolloid stem from its physical structure or shape (determined by the sugars it is made from), and its chemical properties: its size, its charge, and the distribution and composition of different side chains along the main sugar chain. Where Do Hydrocolloids Come From? Many hydrocolloids are derived from natural sources, such as seaweed, seeds, roots, tree sap, fruit peels, etc. Many cultures have employed some of these naturally-derived hydrocolloids for thousands of years. Agar, for example, comes from seaweed, and is a traditional ingredient in Asia. Carrageenan, known as Irish moss, has been used in traditional Irish cooking for centuries. Gum arabic (tree sap), locust bean gum (seeds of the carob tree), and gelatin have also been used for thousands of years. Pectin, naturally occurring in fruits, has always been used to make jellies and jams. Some modern but still all-natural hydrocolloids, such as xanthan and gellan, are produced by bacteria. Other hydrocolloids are produced by modifying natural ingredients to create new compounds not found in nature. The most important of these are the cellulose-derived hydrocolloids: methylcellulose, hydroxypropylmethylcellulose, etc. These modified products, while not “all natural,” are still safe. Since hydrocolloids are derived from natural sources, they are not uniform. Two samples of the same product might have different average molecular weights, and will therefore perform differently. Even the molecules within a given batch of hydrocolloids will vary in size. As a result, commercial manufacturers usually specify a range of weights. By carefully selecting hydrocolloids of different molecular weight, gum manufacturers can also develop products with specialized properties. Some hydrocolloids, such as carrageenan, are made of a mixture of similar but slightly different molecules. The ratios of the different types of molecule vary from batch to batch. Manufacturers blend these hydrocolloids to provide a consistent product, but often the blends will produce consistent results only for a specific application—the mixtures are standardized to do one particular thing very consistently. Many carrageenans, for instance, are standardized to gel milk at a certain strength. The variability in hydrocolloids is one reason that it is not only important to know the name of a hydrocolloid—for example, Alginate—but also its manufacturer and exact specifications, such as alginate, ISP Manugel GHB. When writing recipes, try to list the exact hydrocolloid used. Hydrocolloids are either linear or branched. Most are linear, meaning they are composed of one long chain with small side chains. Branched hydrocolloids, composed of many branches joined together in a bushy shape, include tree gums such as gum arabic and the starch amylopectin. Counterintuitively, branched hydrocolloids typically display lower viscosities (lower viscosity means thinner; higher viscosity means thicker) than linear hydrocolloids of the same size. Branched hydrocolloids are compact, acting like tennis balls, while linear hydrocolloids act like a tangle of spaghetti moving about in solution, taking up more space. For a given hydrocolloid, larger molecules having more sugar units will produce higher viscosities. Most hydrocolloids have important side groups on their main sugar backbone chain. 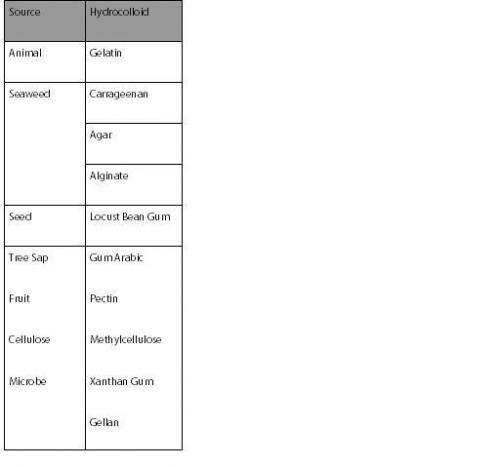 These side groups affect solubility, gelling ability, susceptibility to salts, etc. Agar and different types of carrageenan (which have very different properties) differ only in their side chain groups. All cellulose derivatives have the same backbone: a cellulose molecule, with different side chains. Sometimes two different hydrocolloids differ only in the distribution of their side chains; the very different properties of locust bean gum and guar gum are the result of a difference only in the way their side chains are arranged. Hard/Soft: How much force does it take to rupture the gel? Brittle/Elastic or Springy: Does the gel break suddenly or deform? After the first bite, does the gel return to its original height? Cohesive: Is the gel difficult to break up in the mouth? Does it stay together? Gummy: Is the gel hard and cohesive? Chewy: Is the gel both gummy and springy? Adhesive: Does the gel adhere to the teeth or palate? Thermo-reversible/Irreversible: Thermo-reversible gels melt when heated to a high enough temperature (with the exception of methylcellulose, which forms thermo-reversible gels that set when heated and melt when cooled). Thermo-irreversible gels will not melt when heated. Some gels are thermally reversible, but the melting temperature is so high that they don’t melt in practice (high-acyl gellan). Tendency for Syneresis: Syneresis occurs when liquid weeps out of a gel over time, as happens in custards. Agar is prone to syneresis; water can be expelled merely by pressing on it. Some gels only experience syneresis after long periods of time. Many gels that are ruined by freezing (see freeze-thaw stability, below) tend to weep when thawed. Within a given hydrocolloid system, harder gels tend to weep more than softer ones. Freeze-thaw stability: Gels that may be frozen and thawed repeatedly are called freeze-thaw stable. Many gels begin to degrade after freezing; only one freeze-thaw cycle is advised. When an unstable gel is frozen and later thawed, its texture and structural may be compromised by the physical changes. To offset this effect and promote freeze-thaw stability, a second thickening hydrocolloid may be added to the gel system. Clarity: The addition of some hydrocolloids yield gels that are more transparent than others. Flavor release: Flavor release describes how well a gel expresses the flavorings with which it has been made. Flavor release is determined by many gel texture properties. Gelatin, for example, is considered to have excellent flavor release mainly because it melts in the mouth, whereas alginate is said to have poor flavor release because it tends to lock up flavors. Shear reversibility: Shear is a force in which parallel objects move in opposite directions in a “sliding” motion, such as in the action of scissors cutting or a razor shaving. Stirring produces a shear, as does blending. Very fast blenders are called high-shear blenders. A shear-reversible gel will reform after it has been broken by a shear force. Most gels are not shear reversible. Shear thinning: Water has the same viscosity no matter how fast or how hard it is stirred. Liquids that display this characteristic are called Newtonian fluids. Most hydrocolloids, however, display non-Newtonian behavior and tend to get thinner as they are sheared (known as pseudo-plastic behavior). Large tangled hydrocolloid molecules that are aligned randomly in solution tend to be thick. As shear is applied to the solution and the molecules start to move, they tend to align themselves in planes, causing them to grow thinner the more vigorously they are stirred. Yield point: Some hydrocolloids act like a gel when standing still and liquify instantly under shear. Hydrocolloids with yield points, such as xanthan gum, are useful as stabilizers in foods like salad dressing. The dressing acts like a gel when it’s sitting on the table: the oil droplets stay dispersed in the bottle. But when the dressing is poured, it flows like a liquid. A related term sometimes used synonymously with yield point is thixotropic. Thixotropic fluids, such as ketchup, act as a solid until they are sheared with sufficient force for sufficient time. Fluid gels: Hydrocolloids can also form fluid gels. Fluid gels have the properties of both a fluid and a gel. Agar fluid gels can look like hair gel on the plate but feel like a smooth, creamy sauce in the mouth. Gellan can make a fluid gel that diners will experience like a soup but that will suspend large particles as if it were solid. It is extremely important to understand when and why a hydrocolloid gels since this behavior typically determines which hydrocolloid is appropriate to use. Many hydrocolloids gel when cooled. Sometimes these gels can be melted again, such as gelatin, and sometimes they cannot, such as the pectin in a jam. Methylcellulose forms a gel when heated that melts on cooling. Some thermally reversible gels show temperature hysteresis, that is, the setting temperature of the gel is lower than the temperature needed to melt the gel. This property can be very important to a chef. For example, agar sets around 35°C but melts at around 90°C. The low set temperature makes agar easy to work with, and the high melt temperature allows agar preparations to be served hot. Thermally formed gels can also be slow set or snap set. Snap setting hydrocolloids, like gellan, gel instantly below their gelation temperature. Some hydrocolloids form gels in the presence of positively charged ions, mainly calcium and potassium. In these instances, the positive ion fits into negatively charged areas in the hydrocolloid, allowing two hydrocolloid molecules to stick together in a structure similar to an egg-crate. In some cases, like alginates, these gels are not reversible; in others, like kappa carrageenan, thermo-reversible gels are formed. It is extremely important to control the amount of calcium in solution when dealing with calcium-dependent hydrocolloids. If too much calcium is present, the hydrocolloid will gel immediately, a process that is called pre-gelation. Sometimes, the hydrocolloid simply will not hydrate in a recipe. In these cases, chemicals called sequestrants are added to these solutions to prevent pre-gelation and allow proper hydration. Sequestrants have the ability to bind with ions like calcium more effectively than hydrocolloids can. In many cases, the amount of calcium in tap water alone can cause pre-gelation of a hydrocolloid if not treated with sequestrants. Acidic solutions (low pH) also need more sequestrants than neutral solutions because many calcium impurities are more soluble and affect hydrocolloids more at low pH (see section on calcium salts and sequestrants). Hydrocolloids do not act like most ingredients. In general, do not expect to be able to mix two hydrocolloids without changing their properties. When two liquids of the same viscosity made with different hydrocolloids are mixed, the viscosity often does not stay the same, but increases. The hydrocolloids have a synergistic increase in viscosity. This effect is used by manufacturers to save money, because they can use a smaller quantity of hydrocolloid in a synergistic system. Another example of synergy is when xanthan gum and locust bean gum, normally non-gelling thickeners, are mixed. Surprisingly, they form a gel. This is called synergistic gelation. Sometimes, hydrocolloids will show synergism with a particular non-hydrocolloid ingredient. For instance, carrageenan plus milk gels at half the concentration of carrageenan plus water. As a rule of thumb, gelling hydrocolloids and thickening hydrocolloids can often be mixed to get the benefits of both (locust bean gum can be added to kappa carrageenan to give it a better texture, for example) without synergistic effects that will damage a recipe. Charged and uncharged hydrocolloids can also often be mixed without incident, like methylcellulose and alginate (for more information on synergistic effects, see Hydrocolloids, by Andrew C. Hoefler, Eagan Press 2004, page 38). For a hydrocolloid to work properly, it must be hydrated and dissolved in solution. When a recipe fails, the problem is frequently improper hydration. Hydration procedures vary from hydrocolloid to hydrocolloid, but there are some important general rules. Hydrocolloids added to water tend to swell as they unfold into solution. The swelling causes particles to clump together forming lumps that are very difficult to dissolve. This phenomenon is familiar to chefs who use starch as a thickener (lumps in the gravy). Many hydrocolloids are even more lump-forming than starch. The trick to hydrating hydrocolloids is to get good dispersion –keep the hydrocolloid particles separated before they start to swell, hydrate, and cause lumps. Industrially, hydrocolloids are often mixed with a non-solvent, like alcohol or corn syrup, or an easily dissolved powder like sugar. This pre-mix helps the hydrocolloid particles get away from each other while they hydrate. In general, hydrocolloids like to be hydrated in pure water. Large concentrations of sugar, salt, starch, alcohol, or anything that competes with the hydrocolloid for water can hinder hydration. Sometimes a hydrocolloid will not hydrate in a recipe. Alginates, for instance, will not hydrate in acidic liquids. In these cases, the hydrocolloid can be pre-hydrated in pure water, and the resulting solution can usually be added to the recipe without a problem. It is a good practice to add hydrocolloid as early in a recipe as possible. Hydrocolloids are usually specified in percent by weight. One kilogram of 2% alginate solution contains 980 g of water and 20 g of alginate. However, to make a 2% alginate solution, most chefs will add 20 g of alginate to 1000 g of water. Although this mix is technically incorrect (this is a 1.96% solution), the effect of the small additional hydrocolloid is negligible, and this method is easier to calculate. To get consistent results, it is important to use the same method every time. Most hydrocolloid work requires accurate measurement. A scale accurate to 0.1 g is essential; in some cases, it is helpful to have a scale accurate to .01 g.
Calcium sequestrants (chemicals that bind calcium ions) are difficult to understand. The two sequestrants most used by chefs are sodium citrate and sodium hexametaphosphate (SHMP). Sodium citrate only works in systems above a pH of 4, while SHMP works in all the pH ranges a chef will ever use. For most applications, SHMP at 0.1% will provide good sequestering ability. Different recipes specify the use of different calcium salts. The three most common are calcium chloride, calcium lactate, and calcium lactate gluconate. Calcium chloride is 36% calcium, is inexpensive, and is very soluble in water, but has a terrible taste. Calcium lactate is 13% calcium, is more expensive, and is not nearly as soluble as calcium chloride, but it tastes much better. Calcium lactate gluconate, or calcium gluconate, is only 9% calcium, is much more expensive than the others, and is not very soluble—it needs to be dissolved in hot water, but is flavorless. In recipes, calcium chloride baths are usually between 0.8 – 1.5%. Calcium lactate and calcium gluconate are usually used in quantities between 2–5%. Hydrocolloids that form gels are easily dispersed when conditions are favorable for gelling. Dispersion (getting hydrocolloid particles as far away from each other as possible before they start to absorb water and swell) is simple to do when a hydrocolloid is added to water in a state favoring gelling because they are not soluble in that state. Dissolution cannot happen when conditions are favorable for gelling. Gelatin cannot be dissolved in cold water. Kappa carrageenan cannot be dissolved in potassium-filled cold water. Hydrocolloid recipes often call for the addition of a hydrocolloid in conditions that favor gelling, to allow dispersion, and then specify putting the hydrocolloid in a condition that doesn’t favor gelling, to allow dissolution and hydration. A chef’s best friend in hydration is the blender, and it’s worth it to get a good one. Blenders use high shear to beat particles away form each other and achieve good dispersion throughout a mixture. Here’s a good technique: Add liquid to the blender, then select a speed that forms a vortex in the liquid without a lot of splashing. Slowly sprinkle the hydrocolloid in the center of the vortex until it is thoroughly dispersed. Continue blending on high until the mixture is hydrated. Gelatin has excellent flavor release and mouthfeel because it melts at body temperature. Its texture is excellent. Gelatin swells in cold water but must be heated to dissolve. Gelatin can be dissolved in a small portion of a recipe’s liquid and then stirred into the remaining liquid so that the entire batch does not have to be heated. Clarification is a very exciting gelatin application. Because gelatin is not freeze-thaw stable, almost any liquid that is cloudy due to suspended protein (including stocks, broths, juices, and purées) can be clarified using gelatin without having to boil the liquid or form an egg-white raft: A small amount of gelatin (roughly 0.5%) is dissolved in the liquid to be clarified, which is then frozen and allowed to thaw. As the mixture thaws, the gelatin block will weep out clarified liquid, leaving the protein and cloudiness behind. In the following recipe, a stock is clarified using its own gelatin. When using this technique on a regular stock with no added gelatin, it is important that the stock not be too firmly gelled, or yield will be low. Stock that almost sets when cold is good enough. Once clarified, the stock will no longer contain gelatin, so the texture and usage will be very different from a traditional clarified stock. Of course, gelatin can be added back to regain a traditional mouthfeel. Natural carrageenans are always come in a mixture of kappa, iota, and lambda types. Manufacturers try to separate the types as best as possible, but total separation is impossible. Carrageenans also vary from batch to batch and are, therefore, standardized for a particular application. When specifying carrageenan, tell the manufacturer whether the application is for a water-based system or a milk-based system. Carrageenans are often used in milk-based applications because they are effective at very low concentrations. Gels can be formed at 0.3% in milk. Kappa and iota carrageenans can be mixed to obtain intermediate textures. Kappa carrageenan shows synergism with the thickener locust bean gum. The addition of locust bean gum makes kappa carrageenan gels stronger, less brittle, more cohesive, and less prone to syneresis. The strongest synergy occurs when mixed in the ratio of 6 parts kappa carrageenan to 4 parts LBG. Kappa-LBG mixes, as they are called, are often used as a substitute for gelatin. Kappa-LBG with the required amount potassium salt is sold pre-mixed. Hydration: disperse in cold water or milk under shear and heat until completely dissolved, usually above 60°C. Kappa-LBG mixes need to be brought almost to the boil to become fully functional, but will set and re-melt at lower temperatures. Solutions up to 3% can be made using cold water dispersion. Solutions as high as 8% can be made if the carrageenan is dissolved directly into very hot water under high shear. Level: Typical usage is roughly 0.75% to 1% in water and 0.35% to 0.5% in milk. Ion sensitive: yes, requires potassium salts to form gel, but is often sold with the needed potassium already present. Agar is very similar in structure to carrageenan. It lacks only carrageenan’s sulfate groups. Agar’s temperature hysteresis is very large compared to most hydrocolloids. Agar gels can be served hot. As a gel that forms quickly upon cooling but does not melt easily, agar is a prime candidate for cold-oil spherification. Liquid agar at roughly 45 to 50°C is dropped into cold oil where it solidifies into balls. These balls are rinsed with hot water and served. Agar also forms good fluid gels. Sauces with consistencies from hair gel to almost liquid on the plate can be created that have very smooth mouthfeels. Agar is one of the few hydrocolloids that is available in many grocery stores, especially Asian grocery stores. Agar has been a traditional ingredient in Asia for hundreds of years. Hydration: disperse in cold liquid and heat while stirring until completely dissolved, usually above 90°C. Making a fluid gel with agar is simple. Make a normal agar gel in the range of 0.6% to 1.2% agar and shear the gel in a blender until a smooth consistency is contained. Agar fluid gels can be thinned with liquid or thickened with xanthan gum. Agar fluid gels can be served hot (do not bring near boiling). Structure: Linear polysaccharide made of mannuronic (M) acid and guluronic (G) acid units. Sodium alginate (usually referred to as alginate) very quickly forms rigid brittle gels that are completely heat stable in the presence of calcium. Alginate gels are formed either through internal setting, or through diffusion setting. In internal setting, a time-release form of calcium is used in the alginate solution. This type of gel forms from the inside. Chefs usually use the diffusion method, where alginate is dropped into a calcium bath. The calcium sets the outside and slowly diffuses to the center of the gel, making it completely solid. The best-known commercial application of this effect is the pimento strip inside a cocktail olive, which is made from pepper purée and alginate. Ferran Adrià popularized this hydrocolloid by making alginate “caviar.” Alginate solution is dropped into a calcium bath where it instantly sets into a small ball. Unfortunately, this preparation has to be done à la minute, because the balls solidify rather quickly and don’t have much flavor when completely gelled. Diffusion setting can also be done in reverse, where a thickened, flavorful liquid with calcium is dropped into an alginate bath. This produces a liquid center with an alginate skin and is usually called “the reverse alginate technique.” The calcium containing centers can also be frozen before they are dropped into the alginate, which makes neater shapes than dropping a liquid into a liquid. It is difficult to make small balls using the reverse alginate technique. Finally, alginate can be gelled by spraying it with a calcium solution out of a squirt-bottle. This technique is useful to set large areas of alginate than can’t easily be dunked in a bath. The most common calcium salt used to make calcium solution is calcium chloride (which has a terrible taste). Other salts are available (see the section on calcium salts and sequestrants). The percentage of alginate in a solution is important in determining gel texture, but the percentage calcium in the setting bath is important too. Stronger calcium baths (higher salt percentages) not only set alginate faster, they set it harder. Alginate gelled in a weak calcium bath will never be as strong as one gelled in a strong calcium bath, because the ultimate strength of an alginate gel is dependant on how fast it sets. Typical alginate “caviars” are roughly .75-1% alginate and are set in a 1-2% calcium chloride or 5% calcium lactate or calcium gluconate bath. After setting, alginate gels set in calcium chloride or calcium lactate should be rinsed in a water bath to remove bitterness. Calcium gluconate does not need to be rinsed. Set alginates should be stored in a storage bath. If stored in normal water, alginate gels will leach out their color and flavor rather quickly. It is a good idea to store the gels in something with a similar flavor and color as the original gel. A small amount of calcium lactacte or calcium gluconate (0.5-1%) can be added to the storage bath to maintain texture. Hydration: disperse under shear using the vortex method described in the hydration section until completely dissolved. If using hard water, flavors with calcium, or acids, add sequestrants before adding alginate(see the section on calcium salts and sequestrants). In acidic conditions, alginate should first be hydrated in pure water with sequestrant and then added to the recipe. Level: Typical usage is roughly 0.5 to 1%. Ion sensitive: yes, forms gels in the presence of calcium. Hydration: hydrate in cold or hot water under shear. Gum Arabic has been used for thousands of years and has always been collected the same way. It isn’t used as a thickener, but as an emulsifier, since it does not thicken until very high concentrations are reached. The small amount of protein present in gum arabic gives it its emulsifying properties. Highly concentrated flavor mixtures can be emulsified with gum arabic, stored, and then diluted without breaking the emulsion. Types: High methoxy (HM), low methoxy (LM) and low methoxy amidated (LMA). HM pectin is the pectin found in jams. It requires acidic environments with large amounts of sugar to gel properly. Different grades of HM pectin are sold based on how fast they set after cooling. Rapid-set HM pectin gels almost instantly below about 85°C. Medium rapidset gels in 5 minutes at 75°C. Slowset takes 30 minutes to set at 65°C. LM and LMA pectins can produce similar results as HM pectins can, but they don’t require acidic conditions or high soluble solids. They do, however, require calcium. They can be set just like alginate. LM pectins are more finicky about calcium levels than LMA pectins, so chefs mainly use LMA pectins. Gel temperature: values ranging from 65°C to 95°C. Types: Methylcellulose (MC), hydroxypropylmethylcellulose (HPMC) (both sold under the Methocel brand by Dow), Hydroxypropylcellulose (HPC) (not discussed), and Carboxymethylcellulose (CMC) (not discussed). Methocel comes in 5 types SG A, A, E, F and K. Each of these types comes in several different viscosities. There are 19 types in all. SG A: SG stands for super-gel. This series is made from methylcellulose (MC) and gels at a very low temperature, 38°C to 44°C. It forms firm rigid gels. A: this series is made from MC and forms a firm gel between 50°C and 55°C, but not as firm as the SG A.
E: this series is made from HPMC and forms a semi-firm gel between 58°C and 64°C. HPMC is more tolerant of acid than MC. E series gums are excellent film-formers and can be used to make flavored papers and strips. F: this series is made from HPMC and forms a semi-firm gel between 63°C and 68°C. The F series is fantastic for making foams. K: this series is made from HPMC and forms a soft gel between 70°C and 90°C. Hydration: Many Methocels can be hydrated directly using the vortex method in cold liquid. F50, the favorite Methocel for foams, works this way. The SG A and A series can be hydrated this way but not reliably. If Methocel has been properly hydrated, the solutions will become clear, thicken appreciably, and set when a small ball of solution is dropped in hot oil (but not above 100°C). To reliably hydrate Methocel, add it to hot liquid above the gel temperature of the series being used, shear, and add enough cold liquid or ice to drop the temperature below the gel point. After the solution is cooled enough, the Methocel will hydrate. Xanthan is a wonder gum. It is very user friendly and can be added to sauces without weighing. It works at any temperature. Be careful not to add too much or foods can become snot-like. Hydration: disperse in hot or cold liquid under shear. Level: Typical usage is roughly 0.2% to 1%. Shearing: under very low shear, xanthan solution acts like a gel. More shear turns the solution into a shear thinning fluid. Structure: Linear polysaccharide made of repeating glucose, rhamnose, and glucuronic acid units with acyl side groups. The textures of high and low acyl gellan fall on opposite ends of the gel scale. High acyl is soft and elastic while low acyl is hard and brittle. The two types can be mixed together to generate intermediate textures. High acyl texture tends to dominate. A middle of the texture spectrum ratio would be 75% low acyl to 25% high acyl gellan. It is easy to form gels that form on cooling with gellan, but it is also possible to form caviar balls with low acyl gellan in a calcium bath. The advantage over alginate is better flavor release. Unfortunately, low acyl gellan is extremely sensitive to calcium, potassium, and even sodium salts when used this way. Typically only salt-free flavors like fruits can be made. Gellan is so finicky with calcium that deionized water is recommended and sequestrants are necessary. Both types of gellan form fluid gels but typically the low acyl is used. Very liquid fluid gels can be made this way, much thinner than agar. Hydration: For normal temperature setting, mix gellan with liquid (and calcium if using low acyl gellan) under shear and heat until the fluid becomes clear and the gellan is dissolved. For calcium setting, add sequestrants to liquid and, using the vortex method, add low acyl gellan to liquid under high shear. Level: Typical usage is roughly .04% to 1%. Gel temperature: increases with ion concentration, with values ranging from 30°C to 50°C. Ion sensitive: yes, gels in the presence of calcium or potassium, but is most sensitive to calcium. Shearing: breaks gel or forms fluid gel.